Although the Nitto NT05 was released a few months ago and is now somewhat old news, we would still like to report on it as we were part of the team that help conceptualize the tire from when it was proposed a few years ago. Because of this attraction we are proud to see it on the market. Although Nitto has always had good product in its DOT Race and street tire market classes, Nitto was notably absent in offerings in the highest niche of ultra high performance near race, street legal tires. Well they are not missing any longer. The Nitto NT05 is the end product of several years of intensive R&D testing, burning rubber at several proving grounds and three different racetracks including the famed Nurburgring. Nitto’s testing focused on balancing the ultimate in dry handling performance with long tread life. A big part of the R&D testing involved dialing in the composition of the NT05’s unique tread compound. The compound developed for the NT05 uses a lot of silica and a special blend of polymer additives to create a flexible and resilient tread material that is very good at conforming to micro irregularities in the road surface. This tread compound works exceptionally well in both wet and dry conditions and is a big step forward in grip capability when compared to the long wear biased compound used in older models of tires. The NT05’s carcass is also designed with ultra high performance in mind. The tires casing is made of two plies of polyester with a high turn-up. The turn up refers to the turn of the plies as they go around the bead of the tire and back up the sidewall. High turn up means that the termination of the plies is higher on the sidewall than normal giving the sidewall 3-4 plies of stiffness from the bead to the tread from a two ply casing. This stiffens the sidewall in the bead area, improving handling by quickening response to steering input while still allowing the sidewall to flex a little in the tread area for smoother ride and layout of the tread to the ground plane for better grip. Two steel belts help with puncture resistance and reduce tread squirm, helping keep the tread flat on the ground without lifting under side load. A spiral wound aramid cap ply prevents tire growth and tread center bulging at high speeds, reducing heat build up and improving speed rating. The spiral winding prevents the formation of a lap seam which is a weak spot under load and an area of differing stiffness that can cause problems at high speeds. 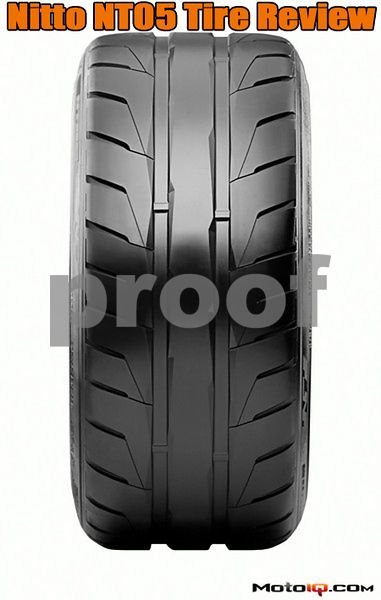 The tires tread pattern features a continuous center rib to maximize tread contact with the road for better dry grip with two large bordering circumvential grooves. The tread to void ratio of the NT05 is a class leading 67.4% putting a great deal of rubber on the road. Reinforced solid tread blocks on the tires outer shoulders give good grip and reduce squirm. Finally the Nitto NT05 has a UTQG tread life rating of 200, amazingly high for an ultra high performance tire. How well does the NT05 work? We installed a set of 245/35-19 NT05’s on an Infiniti G35 sedan for our first evaluation. Although the G35 is a performance sedan, it’s not an M3 but something good to evaluate the tire in an everyday performance driving scenario. Our G35 will soon be receiving some high performance suspension upgrades so we will continue to give long term feedback on the NT05 but even with the stock G35 we were amazed at the tires capabilities. Turn in was ultra crisp with excellent transient response with excellent grip and a progressive smooth breakaway at the limit. The tires were so good that we had to look to make sure Nitto hadn’t shipped us some race compound NT01’s by mistake. The NT05’s were very quiet as well, the quietest performance tire we have ever experienced, a good thing if you have a car like a 370Z which echos road noise into the cabin.. The NT05 might be the quietest tire we have ever experienced period. We think that the treads twin wide circumvential grooves must evacuate air from the tread area noiselessly or something. The NT05 did not seem to follow grooves or tramline either, problems that performance tires sometimes have. The NT05 is not perfect; it does have a rough and harsh ride. Not exceptionally rough but rough enough so you know you are driving a stiff sidewalled ultra high performance tire. Snivelers and fussy sissies need not apply here. It does transmit a lot of tar strip type harshness into the cabin and through the steering wheel as well. These attributes are typical of ultra high performance street tires and the NT05 is no exception. After spending time with the NT05 we like it more and more, we can’t wait to try this tire on other project cars and see how it does in split track/street duty or in classes where DOT race tires are not allowed. We think the NTO5 is going to be one of the tires to beat in these classes and as a daily driving tire as well.